The British Postmark Society (BPS) was founded on 1st January 1958, and thus we are celebrating our Diamond Jubilee in 2018. The BPS exists to promote and to co-ordinate the study and collection of British postal markings (particularly of the 20th and 21st centuries), and the means and mechanisms by which they are applied, and to publish and disseminate the results of our studies. Our members' interests include hand and machine datestamps, slogan and special event postmarks, explanatory and instructional labels and markings, Post Office and Post & Go (Self-Service) postage labels, Royal Mail Online Postage indicia, and printed postage impressions of Royal Mail and other licensed postal operators. Membership is open to students and collectors of British postmarks throughout the world - see the Membership page. 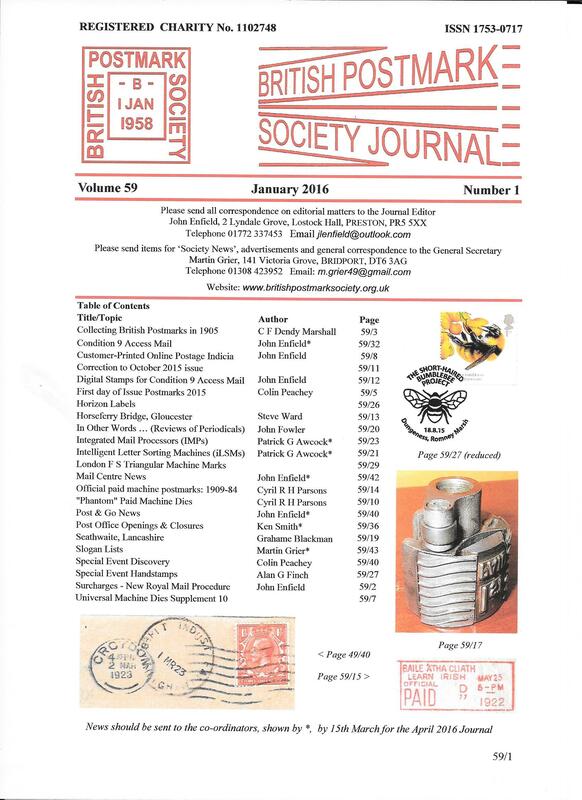 The Society's publications include the quarterly British Postmark Society Journal. and a number of books about different types of postmark - see the Publications page. Our next London meeting will be at Spring Stampex, held on Saturday 16 February 2019 at the Business Design Centre, Islington Green, London, N1 0QH. The BPS Annual General Meeting will be followed by the members' annual competition.